A fully restored turn of the century inn with all the charm of the era. Built in 1907 this beautiful 3 story inn is listed on the National Register of Historic Places. The Inn features 30 guest rooms a full service bar and is home to Gormleys at the Gibson fine dining restaurant. Our wrap around verandas off a unique spot to enjoy a cocktail while watching the sunset or a cup of coffee while watching the sunrise. 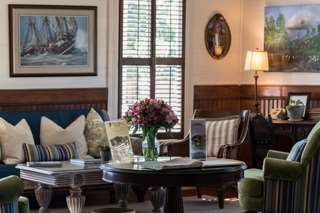 Conveniently located in downtown Apalachicola the Gibson Inn is within walking distance of shops historical homes restaurants and unique art museums. Dixie TheatreBuilt in 1912 and recently renovated the Dixie Theatre hosts seasonal live events. Fort Coombs ArmoryUsed for meetings conferences and receptions. Fully renovated in 2015-2016. Grady BuildingOrignally built in in the late 1880s and rebuilt after the 1900 fire the Grady building houses the Grady Market a unique shopping venue. Chamber of Commerce Visitors CenterInformation on sights activities restaurants and area events. Chapman GardensBotanical gardens located next to Veterans Memorial Park. John Gorrie State MuseumContains a replica of ice machine created by Dr. John Gorrie. His invention became the basis for air conditioning. Rainey HouseBuilt in 1838 was palced on the National Register of Historical Buildings in 1972..